Yes, we should be taking Kim Jong Un’s recent threats seriously. But first, we have to lose the comic-book caricature of his country. Every day the media is filled with reports of North Korea threatening to attack the United States and its close allies. An escalating cycle of threat and counter-threat has been going on for the past few months. It started with the North’s partially successful long-range rocket test in December, was followed by its third test of a nuclear bomb in February, new U.N. sanctions in response to those tests, U.S.-South Korean military exercises, Pyongyang’s bellicose threats to launch strikes against the United States, and now the temporary deployment of long-range U.S. B-2 bombers, capable of carrying nuclear weapons, to South Korea. Americans should be deeply concerned about these events. While the North may eventually be able to put a nuclear weapon on top of a long-range missile and attack the United States, Pyongyang’s bombs can already reach our friends in South Korea and Japan. There is also a danger that North Korea may export nuclear technology to other rogue states, like Iran and terrorist groups. Remember that the North did send a nuclear reactor for producing bomb-making material to Syria — luckily Israeli warplanes destroyed the unfinished facility in 2006. The danger of exports will grow in the future if the North’s nuclear arsenal continues to grow. Infinitely more disturbing than either of these possibilities is the prospect of a second Korean War that would make the devastating civil war in Syria pale in comparison. In the current volatile atmosphere on the peninsula, it is easy to imagine a war started by accident or triggered by a small provocation that rapidly escalates, drawing in the United States and even China, Pyongyang’s closest friend. The destruction and loss of life would be catastrophic. In fact, the North initiated two limited attacks against South Korea in 2010, sinking a naval corvette and firing artillery shells that struck Seoul’s territory, both resulting in the tragic loss of life. Luckily, the United States and South Korea decided not to respond with their own military strikes against the North. Restraint may no longer be possible. During a recent think-tank meeting in Washington D.C, a retired American general asserted that, unlike in 2010, we should respond with force if the North launches another military provocation. His logic was that the North would not retaliate since a full-scale war with the much more powerful United States and its South Korean ally would result in its destruction. That seems to makes sense, but in fact his argument was dangerously flawed. For North Korea — a small nationalistic country that sees itself as beset by stronger external enemies — not responding with force could easily be seen as tantamount to committing national suicide. Starting with the premise that North Korea is a serious problem for the United States and the international community, the first step in figuring out what to do about it should be to figure out what makes North Korea tick. This is a challenging task under the best of circumstances, so it may seem like an even taller order for North Korea, the world’s only hereditary communist monarchy. The task is even harder because of widespread misconceptions about the North. Actually, a myth-based policy helps explain in part why we are in this mess to begin with. During its first term, the Obama administration pursued an approach called “strategic patience,” based on the flawed assumption that isolating a weak North would convince it to stop behaving badly. Although experts with decades of experience dealing with Pyongyang warned that this policy would not work, the administration went ahead anyway. Sure enough, strategic patience had the opposite effect; Pyongyang’s behavior is worse than ever before and its WMD programs continue to make progress. 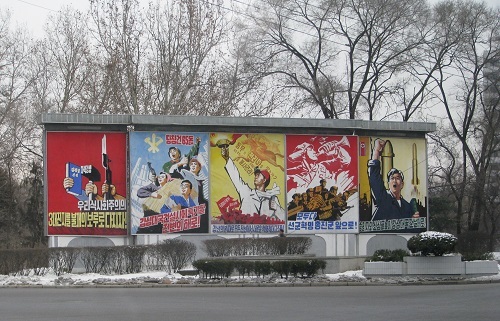 Given this troubling state of affairs, there are five myths about North Korea that must be addressed. North Korea’s leaders are crazy: That has been the rap since Kim Jong Il, the current leader’s deceased father, took power in 1994. While foreigners found Kim to be confident, knowledgeable, and of course ruthless, the perception that Pyongyang’s leaders are crazy has persisted. The jury may still be out on his son, leaving aside Dennis Rodman’s pronouncement, after partying with Kim Jun Un, that he is an all right guy. Still, he made a number of adept moves in 2012, his first year in power, confidently putting his own people in key jobs, for example. If Kim follows the example set by his father and grandfather, North Korea’s international behavior will be based on pragmatic interests, not irrational moves. After decades of maneuvering between the Soviet Union and China, Pyongyang first cozied up to its American enemy after the collapse of the Soviet empire in 1991, when China improved relations with archrival South Korea. More recently the North tacked closer to China when the Obama administration’s tried to punish it for conducting WMD tests. Even Pyongyang’s recent bellicose threats to launch military strikes against the United States, while disturbing, are not crazy. They are the predictable response to new sanctions and U.S.-South Korean military exercises of a country that believes the best defense for dealing with powerful enemies is a good offense. North Korea is a failed state: The assumption is that Pyongyang desperately needs economic assistance from the outside world and the only way to get it is for the North to give up its nuclear weapons. Wrong again. North Korea did come close to being a failed state during the 1990s because of mass starvation. But Pyongyang weathered that storm. The regime is firmly in the saddle and its new leader has enacted measures to vitalize party control. The economy has stabilized and even improved. Despite sanctions, trade has expanded significantly, not just with China but also with South and Southeast Asia, Africa, and Europe to the point where the North may have even enjoyed a current account surplus in 2011. Still, life in the North remains grim. But conditions in Pyongyang are better and improving, certainly compared to stagnation in the countryside, where periodic and chronic food shortages persist. There is no comparison between the North and developed countries like South Korea. But it fits in if compared to developing countries in Asia, Africa and Latin America. North Korea cheats on agreements: Actually, sometimes it does and sometimes it does not. The first nuclear agreement between the U.S. and North Korea collapsed in 2002 after eight years in force, in part because of cheating by Pyongyang, but it did head off a nuclear weapons program that could have produced as many as 100 bombs. A nuclear deal brokered by China in 2005 requiring Pyongyang to give up its weapons program faltered after the Bush administration imposed new economic sanctions on the North before the ink was dry. A U.S.-North Korean deal in 2012 that imposed a moratorium on the North’s long-range rocket tests collapsed when Pyongyang claimed its rockets intended to launch satellites into space were exempted, not a minor point since those tests could help develop nuclear-tipped missiles. Outside the WMD arena, the record is also mixed. For example, after private aid organizations began delivery of 100,000 tons of food assistance to the North in 2008, while most of the assistance reached its intended destinations, they discovered that a small amount had disappeared. On the other hand, aid groups engaged in local projects to help increase food production found the North abided by its agreements. Beijing will solve this problem for us: The theory that Beijing can set Pyongyang straight because of its close relationship with the North ignores reality. There are important limits on what China can and cannot do. Having influence is one thing, being the North’s puppet-master another. Hundreds of years of bad history between Korea and China, plus decades of dealing with a giant communist neighbor have taught the North how to manipulate China. Moreover, Beijing may be unhappy with the North’s bad behavior. But it cannot just throw Pyongyang to the American and South Korean wolves since maintaining quiet, stable borders to facilitate its own economic development is a critical priority. Finally, why should the Chinese help the United States? It’s a fair question because of the overall bumpy state of bilateral relations. True, both countries would prefer that the North not develop a nuclear arsenal or threaten its neighbors but from Beijing’s perspective, Washington is also ignoring its interests in a peaceful, stable peninsula. The result is a dialogue of the deaf; Washington urges Beijing to punish Pyongyang for bad behavior while Beijing urges Washington to engage in serious talks with Pyongyang. None of this analysis is meant to dismiss the horrific realities of an authoritarian North Korea, which is guilty of a multitude of human rights violations. But painting a black and white, comic book caricature of North Korea only increases the chances that we will continue pursuing misguided policies. Recent history — Vietnam, Iraq and Afghanistan — is littered with the pernicious results of not understanding what makes adversaries tick. Wow, I am so glad to see this piece. It should be widely read especially by the Washington Foreign Policy establishment. I suspect many policy makers know about these myths but cannot seem to change the Washington policy because of inherent interests in the military-industrial complex. Pyongyang had warned the US that the Agreed Framework was close to collapse as the LWRs hadn’t been built and the oil wasn’t being delivered, but the neo-cons ignored them, until it suited them to claim a North Korean official confessed to US negotiators in an aside in a corridor that the North had broken the deal. It was a farce. Also China is entreated to defend North Korea, so if the US did attack it’d get messy quickly. China likes having the North there as a buffer against the US-dominated South Korea, and it serves as a nostalgia theme-park for China’s new middle-age, middle class to go visit and relive the pre-Deng years. China does what’s needed to keep the North there but not to let things really kick off – it doesn’t want a war, but nor does it want the North to collapse because that’d mean millions of refugees into China and untold quantities of weaponry going missing. Indeed the US likes having North Korea there as it gives them a reason to have a huge military presence in the area, which is really about being in China’s face but which can be pretended is to with North Korea. Then there’s the Christian aspect that what really ticked off the Americans in 1949 was the loss of a massive Christian congregation in China and then more of the same in North Korea, and the American church wants it back.